Planning for Tomorrow . . . This is the Summary of the Planning for Tomorrow Meeting which took place May 06, 2018. Meeting Notes are Downloadable as a PDF. St. Michael’s is a thriving parish, and needs more room to grow. We are in need of a new office, more parking space, more meeting rooms … the list is endless. Recently our parish has purchased 6 lots to the north of our property. 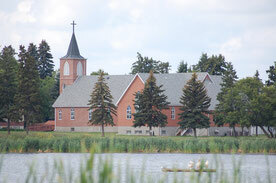 The Archdiocese of Edmonton lent us the money to buy the land; now we have to repay that money. This is an easy way for us to fundraise without a single penny coming out of our pockets. For every card that is purchased, a percentage of the money stays in the parish. We all have to buy gas and food - so why not buy these items with our parish grocery cards??? The cards include Co-op, No-Frills, and Sobeys/Safeway. They can be purchased with cash, cheque, Visa, Master Card, or Debit. Co-op cards can be used to purchase groceries, gas or hardware. 10% of all cards purchased is profit towards Planning for Tomorrow. Sobeys/Safeway cards can be used to purchase groceries at Sobeys, IGA or Safeway. They give us a return of 8%. President's Choice Cards can be used to purchase groceries and gas at No Frills, Extra Foods, Superstore and Wholesale Club. They give us a return of 4%. that provides us with the strength to work together. You always provide us with all we need. and trust that you will give us the answers in your time. built on your gifts of faith, hope and love.